Ernesto Espino, former manager of Potable Water and Sanitation with the Coordinating Office of Special Projects for the Valley of Mexico of the National Water Commission (CONAGUA; Mexico City), gives a presentation at Water Environment Federation (WEF; Alexandria, Va.) headquarters on April 25. WEF photo/Jennifer Fulcher. The Valley of Mexico, a region surrounding Mexico City, has been experiencing an increased demand for a continually shrinking supply of water. On April 25, Ernesto Espino discussed the valley’s water problems and potential solutions during a luncheon of the U.S. chapter of the Inter-American Association of Sanitary & Environmental Engineering (Arlington, Va.) held at Water Environment Federation (Alexandria, Va.) headquarters. Espino, former manager of Potable Water and Sanitation with the Coordinating Office of Special Projects for the Valley of Mexico of the National Water Commission (Mexico City), discussed the Valley of Mexico’s sustainable water program. Announced in 2007, the program promotes advanced wastewater treatment and reuse. The Valley of Mexico has experienced an increase in population, urban areas, and water demand, as well as a decrease in the size of its lakes. To meet demands, water has been imported from other basins, and the government has pumped more water out of local aquifers, causing soil subsidence. Espino discussed the Valley of Mexico’s water problems and potential solutions during a luncheon of the U.S. chapter of the Inter-American Association of Sanitary & Environmental Engineering (Arlington, Va.). WEF photo/Fulcher. “Sustainable water practice in the Valley of Mexico is possible and can be achieved at a reasonable cost, provided that we use modern wastewater reclamation science and technology,” Espino said. In 2007, the sustainable water program was established to address the overdraft of local aquifers, ensure wastewater treatment before release into the environment, ensure the health of agricultural areas irrigated with wastewater, lessen dependence on imported water, and develop reliable and sustainable water sources, Espino said. This program relies on reclamation of municipal wastewater and aquifer storage and recovery (ASR), he explained. “Scientific and technological advances in the past 50 years in the field of water and wastewater treatment make wastewater recovery the most efficient, economic, and flexible tool to achieve water balance in basins with water shortages,” Espino said. Using reclaimed water for ASR has been a controversial part of the program, but the best solution may require going against the inertia of sticking to business as usual, he explained. Espino explained that using technological and scientific advances need to be applied to a holistic water management program to solve the region’s water-supply problems. WEF photo/Fulcher. “A regional water management program must address holistically, all water-related issues,” Espino said. “We cannot separate water supply, stormwater management, wastewater reclamation, resource recovery, aquifer balance, [and] environmental pollution.” Using advanced technology to reclaim water and having engineers and scientists make a special effort to educate the public and decision-makers about the advanced wastewater treatment and reclamation are key to successful programs, he added. 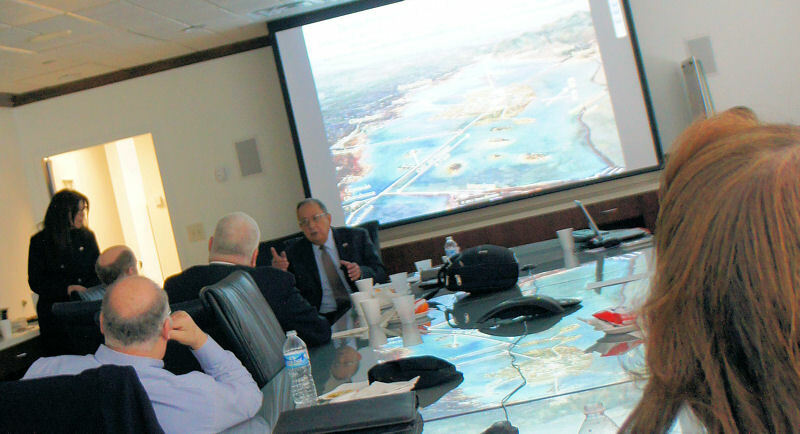 Espino provided an overview of the El Caracol Wastewater Treatment Plant, which is scheduled for completion in 2015 and will reclaim wastewater for ASR. Espino also described the Atotonilco Wastewater Treatment Plant that he helped design. The facility provides advanced treatment through pretreatment, primary, secondary, and chemical processes with an in-house energy-generation system expected to provide 60% of the facility’s total energy demand. “To ignore the potential benefits of wastewater recovery in water management programs can only be done at a great cost in economic, social, and ecological terms,” Espino said.